(September 2017 through Present) Bro. Steve Skagges presented his resignation as pastor of Muldraugh Hill Baptist Church to the Chairman of the Deacons, Mark Carney, and to the congregation at the conclusion of the Morning Worship Service on September 3, 2017. His last day will be September 24, 2017. The Monthly Business Meeting was held on September 6, 2017. Ernest Carol Taylor served as the moderator. (Click to view summary of minutes) On Sunday, September 24, 2017, Bro. Steve Skaggs gave his last sermon as pastor of Muldraugh Hill Baptist Church. A reception/meal was held in honor of Bro. Steve and Shirley to thank them for their service the last 5 years. They were presented with a love offering and two Cracker Barrel rocking chairs with their names and the church name engraved in them and the placement of a UK Wildcat emblem, Bro. Steve's team. It was announced during the Morning Worship Service by Mark Carney, Chairman of the Deacons, that a discussion will be held at the next monthly business meeting on October 4, 2017 to start the process of forming a Pulpit Search Committee. Bro. Steve published his last “At The Break of Day” (ATBOD) message on September 30, 2017: September 30, 2017 -- “At the Break of Day” “At the break of day” has, from the beginning, meant to inspire you to have a daily devotional life. Prayer and scripture should always be the basis of our daily devotions. Paul wrote, “For God, who said, ‘Let light shine out of darkness,’ made his light shine in our hearts to give us the light of the knowledge of the glory of God in the face of Christ” (II Corinthians 4:6). Perhaps his thoughts were inspired by Psalm 119:105, “Thy word is a lamp unto my feet, and a light unto my path.” There are so many good devotional resources available today including posts like this one. And, while I use these myself, my personal preference is to have a book in my hands. Plus you know that I would tell you to not neglect the hymnal as a devotional resource. Looking at hymns as devotional poetry rather than between the lines of music can bring new insight to even the most well- known hymn. But you can have a devotional moment with just your Bible! We can, of course, pray and have devotional times any time during the day but I believe following Jesus’ example works best: “Very early in the morning, while it was still dark, Jesus got up, left the house and went off to a solitary place, where he prayed” (Mark 1:35). He spent time with His Heavenly Father the very first thing and we should too before the busyness of our day becomes a distraction. This is the last day I will share my thoughts in this space. Thank you always for beginning your day here and for sharing these words with others. May you continue to “grow in the grace and knowledge of the Lord Jesus Christ” (II Peter 3:18) as you seek Him daily. Bro. Steve The Monthly Business Meeting was held on October 4, 2017. Ernest Carol Taylor, Assistant Moderator, led the meeting. Mark Carney, Chairman of the Deacons, assisted with the process. (Click to view summary of the minutes) The church family was very saddened upon the death of Elizabeth Jarboe Farmer on on October 7, 2017 at the age of 85. She served for many years as a Sunday School teacher, was a Vacation Bible School teacher, was on multiple committees, and was honored in August 2015 for over 50 years of service at the WMU Director. She also received 28 years of Sunday School Perfect Attendance Awards! She will be greatly missed. 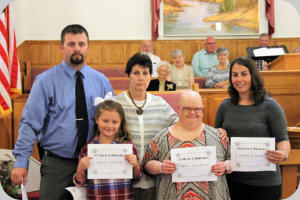 Sunday School Perfect Attendance Awards were presented during the Morning Worship Service on October 15, 2017 to the following: Karli Veatch (4 years), Michelle Gribbins, (14 years), Jessica Veatch (16 years), Ann Lee (19 years) and Josh Veatch (29 years). At the beginning of the Sunday Morning Worship Service on November 5, 2017, a “Special Business Meeting” was called by the Moderator, Ernest Carol Taylor, for the purpose of formulating the Pastor Search (Pulpit) Committee. 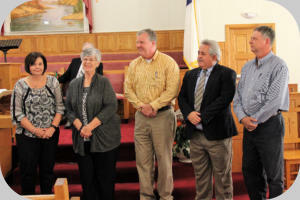 The deacons distributed ballots with the names of 20 individuals who had been nominated, and had agreed to serve, over the previous two weeks, to each church member present . The five people receiving the largest number of votes that would constitute the Pastor Search (Pulpit) Committee included the following: Charlotte Benningfield, David England, Margaret Pyles, Jim Sabo, Jr., and Don Veatch. The Monthly Business Meeting was held on November 8, 2017. Ernest Carol Taylor served as the moderator. (Click to view summary of minutes) The “Hanging of the Greens” Service was held on Sunday night, November 26th at 6:00 p.m. The church was gradually decorated as the the meaning of Christmas was explained for each item of decoration. Then the AWANA children presented the scene of the nativity as Bro. Al Hardy read the Christmas story from Luke 2:1-20. The Safety “Security” Team met for the first time on Tuesday, November 28, 2017 at 6:00 p.m. This Team is being formed to look into what is needed to better protect the members and visitors on the church property. Fourteen men and women attended the meeting. The guest speaker was Travis Begley. He is the head of the security team at Elkhorn Baptist Church in Campbellsville, Kentucky and is a 16 year veteran of the Campbellsville Police Department. The Monthly Business Meeting was held on December 6, 2017. Ernest Carol Taylor served as the moderator. (Click to view summary of minutes) We collected our Annual White Christmas Offering on December 17, 2017 during the Morning Worship Service. Thank you to everyone that gave so generously! The total amount received was $21,768.85!!! Bro. Billy Compton lead us in the Morning Worship Services on December 24th and December 31st. The Pastor Search (Pulpit) Committee presented him as a possible Interim Pastor with a vote to be taken in January. We had our Annual Christmas Eve Candlelight Service on December 24, 2017 at 6:00 p.m. Bro. Steve Skaggs returned for the evening to us to lead the service. We had our Monthly Business Meeting on January 10, 2018. Ernest Carol Taylor served as the moderator. (Click to view summary of minutes) Bro. Billy Compton began serving as our Interim Pastor on January 21, 2018. 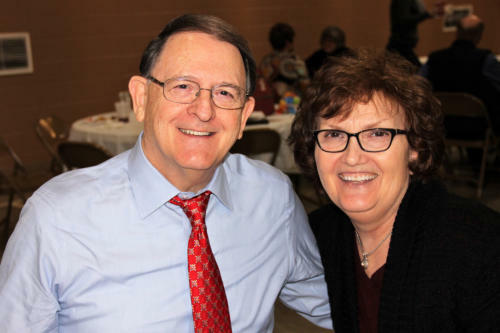 We had a “Meet/Greet/Welcome” time of fellowship to get acquainted with him and his wife, Sue Ann, at our Annual Church-wide Birthday Potluck Meal after the Morning Worship Service. The Monthly Business Meeting was held on February 7, 2018. Ernest Carol Taylor serves as the moderator. (Click to view summary of minutes) On February 18, 2018 during the Morning Worship Service, Erin Cox announced her resignation as Minister of Youth to be effective the end of the month. The Rev. Billy Graham, the Christian evangelist whose worldwide crusades and role as adviser to decades of U.S. presidents made him one of the best known religious figures of his time, died Wednesday (February 21, 2018) at age 99 at his home in Montreat, N.C, Read more about him, including his official obituary at https://memorial.billygraham.org/ See article posted on Kentucky Today website. The Monthly Business meeting was held on March 7, 2018. Ernest Carol Taylor served as the moderator. (Click to view summary of minutes) The 4th Annual Couples Retreat took place on March 9-10, 2018 at Barren River Lake. It was a great time of fun and fellowship! There was an evening session on Friday night and two sessions on Saturday morning. Bro. Billy and Sue Ann led the group in this time of celebrating marriage. The following attended the event: Mark and Kelly Carney, Nick and Rhonda Cobb, Bro. Billy and Sue Ann Compton, David and Lori England, Mckenzie Hardin, Cynthia Tungate Burnett, Rob and Stephanie Keeling, Steven and Shannon Lee, Steve and Carolyn Morris, Mark and Latricia Speer, Josh and Jessica Veatch, William and Robin Watson, Tony and Michelle Yocum. The annual Easter Egg Hunt was on Wednesday, March 28th at 6 P.M. The children and adults enjoyed sandwiches, snacks, and finger foods and a time of fellowship. Kids hunted eggs and heard the story of Easter. 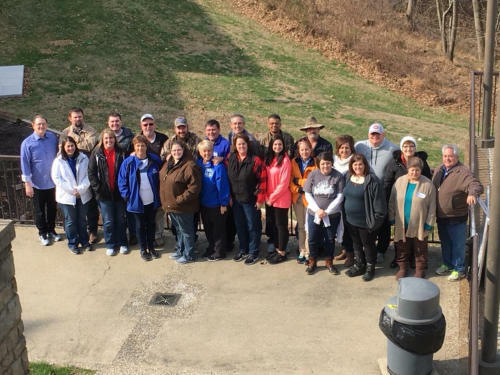 There was a “March Gladness Sunday School Tournament” between Muldraugh Hill and Pleasant Hill churches that concluded after 4 weeks on April 1, 2018 (Easter Sunday). The score cards were tabulated of contacts, visitors and attendance. After the tabulation was completed it was determined that MHBC was the champion. “On behalf of the good people of Pleasant Hill Baptist Church, we would like to invite all of you to a Dessert Fellowship on Sunday evening, April 15th at 6 P.M. in our Christian Life Center.” Your beloved transitional pastor will have the distinct pleasure of throwing a pie in the face of the losing pastor. Many have desired to do this and are anxiously awaiting that moment. See you there, Dr. James Jones The Monthly Business Meeting was held on April 11, 2018. Ernest Carol Taylor served as moderator. (Click to view summary of minutes) The Monthly Business Meeting was held on May 9, 2018. Ernest Carol Taylor served as moderator. (Click to view summary of minutes) Muldraugh Hill Baptist Church showed appreciation to all the mothers attending the Morning Worship Service on May 13, 2018 by presenting each of them with special gift of a MHBC “EZ Gripper” jar opener. Bro. Billy Compton delivered the special Mother’s Day message from 2 Timothy 1:1-5 (Paul’s message to Timothy). “I am reminded of your sincere faith, which first lived in your grandmother Lois and in your mother Eunice and, I am persuaded, now lives in you also.” (2 Timothy 1:5) Mark Carney, Chairman of the Deacons, and Bro. Billy presented special awards, with the assistance of Gayle Bright pinning the corsages. Special recognition was given to (click to view pictures): • The “Oldest Mother Present”: Janet Moore • The “Youngest Mother Present”: Sidney Cox • The “Mother with the Most Children, Grandchildren, and Great-Grandchildren present”: Phyllis Wise (8 descendants) • Mothers present with “A Baby Born Since Last Mother’s Day”: Sidney Cox and Tiffany Underwood • Mark Carney recognized Clara Evans with a vase of flowers. She is recognized as the “Oldest Mother on the role of Muldraugh Hill Baptist Church”. She is 98 years old. On Sunday, May 27, 2018, during the Morning Worship Service, there was a Special Called Session of the Business Meeting in order to vote whether to call Ms. Lidiane Macedo as our new Minister of Music. Ernest Carol Taylor served as moderator. There were 61 “yes” votes and 35 “no” votes. The position was offered and accepted by Ms. Lidiane Macedo. She is very excited to begin her service at Muldraugh Hill Baptist Church! She has a Master in Music with emphasis on voice performance, has led various choirs, and prior to accepting the position with MHBC, was the Assistant Choir Director at First Methodist Church in Campbellsville. She is also employed as an Exceptional Child Education Instructional Assistant at Marion County Middle School. During the Morning Worship Service on May 27, 2018 there was a Special Memorial Day Service in which the names of loved ones who passed away since last Memorial Day were read by Bro. Billy Compton. The church bell was rung once after the reading of each name. Click to view the names that were read during the ceremony. The Monthly Business Meeting was held on June 6, 2018. Mark Carney, Chairman of the Deacons, served as moderator. (Click for summary of minutes) Vacation Bible School was Sunday, June 10th through Friday, June 15th from 6:00 P.M. to 8:30 P.M. Friday Night, the last night of VBS, was family night. The theme was “Game On! Gearing Up for Life’s Big Game”. What a great time of fun, fellowship, and learning more about God and his teachings! Muldraugh Hill Baptist Church showed appreciation to all the fathers attending the Morning Worship Service on June 17, 2018. A gift in honor of them will be given to Hosparus. They were also each given a key chain. Special recognition was given to (see pictures): • The “Oldest Father Present”: Jim Bob Moore (92 years) • The “Youngest Father Present”: Jesse Cox • The “Father with the Most Children, Grandchildren, and Great-Grandchildren present”: Ernest Carol Taylor (7 descendants) • The “Fathers with a Child Born Since Last Fathers Day”: Jesse Cox and Andrew Dornbrook • “Oldest Father not Present”: Howard Farris (represented by granddaughter, Mckenzie Hardin) • Homebound Father: Tommy Farmer (presented to sister, Anita Lanham) The Pastor Search Committee, on Sunday June 17, 2018, during the Morning Worship Service, gave a report of their work and made a recommendation that MHBC call Bro. Billy Compton to be our next pastor. The Committee will present this recommendation in the form of a motion at our next scheduled business meeting on July the 11, 2018, and if seconded, the church will be given a 1-week notice on Sunday July 15th of the upcoming vote on the call that we are extending to Bro. Billy. The vote will be taken on morning, July 22, 2018 from all members that are present. The Church Constitution and Bylaws requires a three-fourths majority in the affirmative to extend the call, and then Bro. Billy has the option to except the call based upon the vote. Please be in prayer for this important time in our church. Upon making the announcement, there was a standing ovation by most members of the congregation. The musicians of the church were recognized during the Morning Worship Service on July 1, 2018. Each pianist/organist was given a special gift of appreciation for his/her commitment and service over the years. Those recognized were: Wanda Buckler, Amanda Farmer, Annette Dennison, and Martha Whitehouse. David England was recognized but not present. Each were asked how many years he/she had been sharing their talents at church. The exact years were not known but Wanda and Martha voiced they had been playing the piano or organ since they were fourteen years of age. Lidiane Macedo was recognized as the new Minister of Music and also given a gift of appreciation. Jim Sabo, Sr. was recognized for his service as Minister of Music since 2006 (nearly 12 ½ years) of which he donated all his salary back to the church. He was given a plaque commemorating those years of service, a statue of a microphone and was shown a standing ovation from the congregation. There was a Music Ministry Appreciation Meal after the morning worship service. The church provided the meat, bread, drinks and the rest of the meal was potluck. What a great time of fellowship! (See Pictures) MHBC had a great night out as a church family at the Evening Worship Service and Baptism of McKenzie Bagwell and surprise birthday party for Bro. Billy on July 1, 2018 on the farm of Donnie Veatch. It was estimated around 90 were in attendance. The Monthly Business Meeting was held on July 11, 2018. 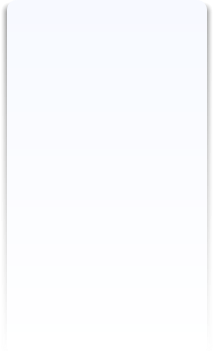 (Click for summary of minutes). A Special Called Business Meeting was held on July 22, 2018 during the Morning Worship Service. Mark Carney served as Moderator. The church members present were asked to stand and they were each given a ballot by members of the Pastor Search “Pulpit” Committee. Once their ballots were completed the ballots were collected by the committee and taken to be tallied. After the service, the results of the vote were reported by Mark Carney. There was an overwhelming 99.2% (120 yes; 1 no) affirmative “yes” vote to call Bro. Billy Compton as the next pastor of Muldraugh Hill Baptist Church! Bro. Billy accepted the call after the announcement of the vote was made. Bro. Billy and Sue Ann expressed their desire to move their membership to Muldraugh Hill Baptist Church. The congregation filed by after the service to welcome them as members and to congratulate/welcome Bro. Billy as the new Pastor. See Pictures Lidiane Marcedo left for Brazil July 23, 2018 to care for members of her family and to meet the requirements necessarty to renew her VISA for the next two years. She will return in about 4 weeks. The church took up a Freewill Love Offering for her following the morning worship service on July 29, 2018 to help with the costs of her travel expenses since she will not be receiving a salary during the time she is gone. Posted on July 29, 2018: At the next business meeting on Wednesday, August 8, 2018, the Personnel Committee will be recommending MaKayla Sabo and Caden Wheatley to fill the position of Youth Ministers. Please continue to pray for this vital ministry position in our church.